Today we are going to need all our nerves and steadiness of character. Alcohol may be necessary at some points. We are going to read two execrable poems by two poetic plodders. Having thus established how bad things can get in the hands of nonentities we can see what happens when a true poetic genius takes over and a musical genius sets the result to perfection. Our first poetic plodder is the German poet and writer Friedrich von Matthisson (1761-1831). Matthisson had a career, his work was published and some of his poems were set to music by Beethoven and Schubert, no less. There is a God, however, and after his death he sank quickly into highly deserved obscurity. However, we cannot criticize Schubert for lacking discrimination in setting Matthisson's work. In 1814 he was an 17 year-old in a frenzy of song composition who set whatever texts that he could get hold of that were halfway suitable for music. His restricted literary upbringing under the heavy-handed religious and political censorship of the time meant that he had no easy access to verse that was not rigidly conventional and blandly orthodox. He thus had had little chance to develop the advanced critical literary faculties that come so easily to us sages, looking back two centuries later. He was virtually penniless throughout this period and could not indulge himself in book acquisition: just getting paper on which to write his compositions was expensive enough, never mind that grotesque luxury, pre-ruled paper! His reading was therefore restricted to whatever he or his friends could borrow. Think on: It is an indication of the paucity of his literary sources that so many of his texts were written for him by friends such as Mayrhofer, most of whom were fortunately much better poets than Matthisson. I think of you when through the grove the chords of the nightingale ring! When do you think of me? I think of you in the gloaming of the evening light at the shaded spring! Where do you think of me? I think of you with sweet pain, with anxious longing and hot tears! How do you think of me? Oh think of me, until we are united on a better star! Whatever the distance I only think of you! If you have managed to keep your breakfast down whilst reading this I can only congratulate you: it took me some effort. Firstly, we know immediately without any further thought that a poem is rubbish when in the space of four short verses five exclamation marks are required to convey emotion, because the words themselves are incapable of doing that. Secondly, invented words are heaped up without regard for meaning or syntax. The second verse is an egregious example of this: we have a twilight glow (Dämmerschein) in an evening light (Abendhelle) at a Schattenquelle, which, one can only presume, means a shady spring, but could be a source of shade or a spring giving shade – it is just two pleasant words pushed together for effect. The repetition of the phrase ich denke dein as the first line in the first three verses is tedious showmanship, only exceeded in tediousness by the artifice of mutating the boilerplate question in the closing lines through 'when', 'where' and 'how'. This poem is written by a talentless versifier setting a not very clever conceit above any objective correlative of emotion there might otherwise be in the poem. The structure of the first three verses contributes nothing to the emotional impact of the poem. It is just a kind of empty showing-off with a Sudoku puzzle. Even more surprisingly, the rhyme scheme – two rhymed couplets and a final line (a-a-b-b-a)– actually contradicts the overall structure. The final verse reverses the pattern. It does this for no emotional reason, it is just an empty mannerism and as such offers no resolution of the preceding three verses. The expression 'better star' usually means Heaven – in English we would say 'a better place' – so the only hope of a reunion on offer here is death. We can state categorically that if the author of this poem does indeed end up there it will only be after a long period of purgation for his sins against the German language. And finally, if you need more evidence, consider the way the short four- and five-syllable lines, each stopped with some kind of rhyme and hardly requiring any punctuation, stagger through each verse. This poem is simply doggerel. Enough, already – it cannot be borne! 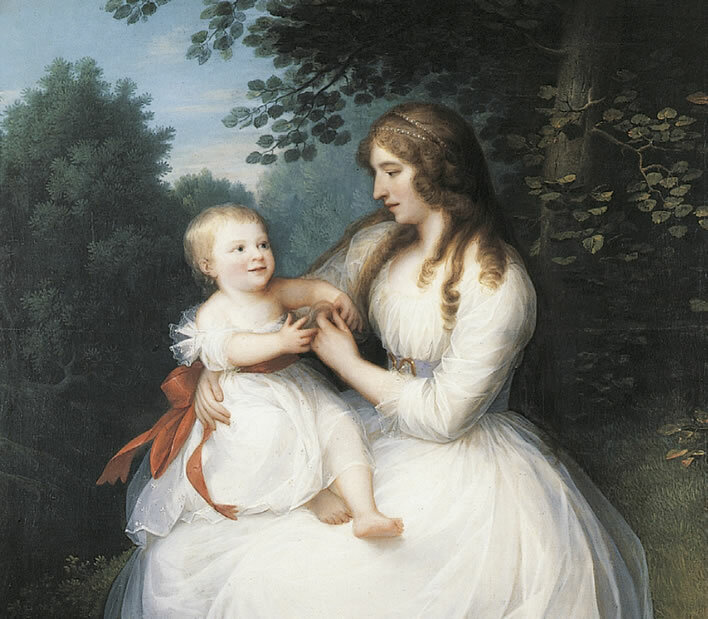 Friederike Brun with her daughter Charlotte, 1789, Erik Pauelsen (1749–1790). I think of you when spring paints itself in a rain of blossom and when summer's gently ripened blessing gleams in ears of corn. I think of you when the ocean lifts up roaring towards heaven and the shore quakes groaning back from the billows' rage. I think of you when the evening redly loses itself in the grove and Philomela's lament softly piping stirs the soul. I thought of you in the dim lamplight in bitter suffering; the fearful soul pleaded, close to departure: remember me! I [shall] think of you until waving cypresses surround my grave; and even in Tempe's grove your name will bloom unforgotten. Brun has pared down her friend's mannered constructions – for that at least we should be grateful. Oh, and the lines are longer, which helps a bit. Unfortunately, in order to compensate for the lost Sudoku she has cranked up the imagery, although, it has to be said, her kitsch is at least a little more comprehensible than Matthisson's. The verses consist of four lines, the rhyme scheme is a-b-a-b, although, in the last verse, she is clearly struggling to keep this up: only someone with a tin ear can call umziehn and blühn a rhyming pair. Her rhyming of the adverbs tönend-stöhnend-röthend-flötend across two verses is quite disturbing, effectively creating a new rhyme scheme a-b-a-b|a-c-a-c. The first three verses are filled with nondescript imagery: we have spring (painting itself in a rain of blossom) and summer (glowing with gently ripened blessing of corn ears); we have thundering waves; we have Greek nightingales at a red sunset stirring our souls. If you can't think of anything better, a classical allusion will always add a respectable sheen. After these three verses of general kitsch, in the fourth verse Brun kills off the object of her affection with a miserable, pleading death full of suffering. In the final verse she looks forward to her own death and romantic interment. We note that, unlike in Matthisson's effort, there is no hope of reunion, we are given just another classical allusion. Such poetry has really no redeeming feature, but some people appear to have a personality that responds positively to a stream of syntax-free, sad and soppy expressions. This seems to have been the case with the composer Carl Friedrich Zelter (1758-1832), because he set Friederike Brun's effort to music in 1795. I would like to think that Schubert knew of Brun's poem and Zelter's composition and, despite his circumscribed literary taste, recoiled from them as we have done. Whatever – fortunately he wasted none of his precious energy and expensive score paper on setting Brun's piece himself. Sometime in the spring of 1795 – for want of a more accurate date let us say it was in April, which conveniently places the event 221 years ago this month – Johann Wolfgang von Goethe (1749-1832) was invited to the house of Gottlieb Hufeland (1760-1817) in Jena. 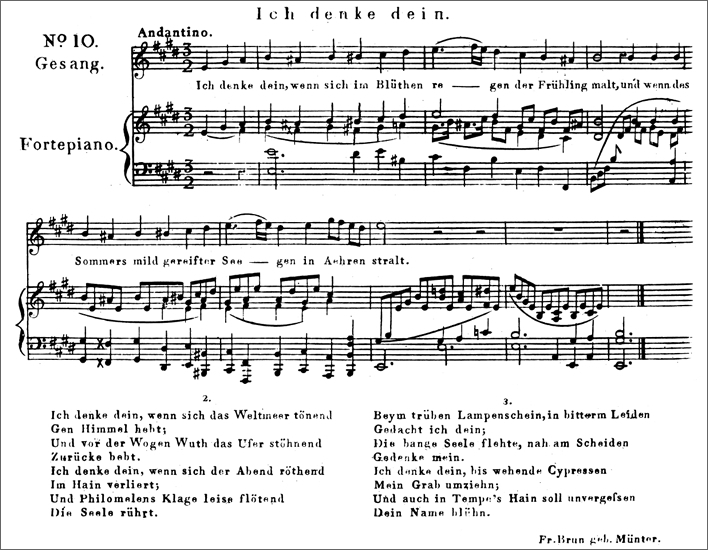 On that occasion a number of songs written by the composer Carl Friedrich Zelter were performed, but Goethe was particularly taken with Zelter's setting of Brun's poem Ich denke dein. So taken was he by the setting that he wrote his own lyric to fit Zelter's music. As usual, we puzzle and ponder: had Goethe thought Brun's effort any good, would he have troubled to replace it? Am I being my usual heartless self in imagining that Goethe was rescuing Zelter's music from Brun's excruciating text? I think of you when the shimmer of the sun gleams at me from the sea. I think of you when the glimmer of the moon is painted on wellsprings. I see you when the dust lifts on the distant road, in deepest night, when the traveller trembles on the narrow bridge. I hear you, when the wave rises with a dull roar. In the quiet grove I often go to listen when everything is silent. I am with you, however far away you are, you are close to me. The sun is setting, the stars will soon be shining, Oh! if only you were here! Grammar tells us that the loved one in this case is male and therefore, in those sexually static times, the speaker of the poem is female. As an aside, therefore, we note that, even in these times of fluid gender assignment, Schubert's setting of this poem should really be performed by a female singer. The title alone is a great improvement on the poem's predecessors because it tells us quite concretely what the poem is about: proximity in spite of separation. In contrast Andenken and Ich denke dein are just vapid titles that match vapid texts. Let us firstly consider Goethe's use of imagery in the poem. In order to turn Matthisson's and Brun's bloodless abstractions (rain of blossom) into imagery the reader's brain has to do a lot of work to construct the scene and extract some meaning and emotion out of it. With this sort of writing the reader is required to project the missing emotion into the text. Goethe shows us how a great writer uses imagery: he projects directly into the reader's mind concrete visualisations: the shimmer of the sunset on the sea, the pale light of the moon reflected in flowing water, the dust raised by a carriage on a distant road, the wanderer's fear in crossing the shaking bridge in the depth of night. (Goethe had experienced such moments at first hand during his tour of the Swiss Alps in 1775 and had clearly not forgotten them). There is also the wonderful ambiguity of the moment when the narrator goes into the silence of the forest clearing to listen, even though – or perhaps because – 'everything is silent'. Compare the sheer muscularity of Goethe's expressive imagery with the insipid phrases thoughtlessly served up by Matthisson and Brun. If only on this level, Goethe is a genius and they are mere plodders, but the height of his genius and the distance to them is revealed when we look at the structure of Goethe's poem, a structure which, unlike his predecessors, is not simply poetic sudoku, but one which adds great depth to the poem. Each of the first three verses presents a particular mode of perception: thinking, seeing and hearing. The perceptions are not in themselves direct observations of the external physical world but are mental states which are brought into being by those observations. The real perceptions all mediate knowledge of the absent loved one, the most telling of these being the act of going into the silent woodland grove simply to listen although no objective sounds are present. The two observations in the first verse set the tone for this mediation in that they are both reflections of reality: the sun is seen shimmeringly reflected from the rippling surface of the sea and the light of the moon is a 'flimmer' – the palest reduction of its image 'painted' onto the surface of the water. The poem also follows a coarse temporal progression: sunset and moonlight in the first verse, deep night in the second and finally, in the last verse, the stars emerge from the blackness. In the final verse, instead of the three modes of perception in the previous verses, we now deal with 'to be' – 'existence'. But the final verse is in two parts. The first summarizes the transcendency of imagination over space: it doesn't matter how far away the man is, the woman feels that he is still close to her. This is the triumph of the imagination over the physical, the consolation of philosophy. It is brave, but inadequate. The second part, in which the stars begin to appear, completely invalidates the world of the imagination we have lived in so far. Only one line after saying that it doesn't matter how far away the man is, she realises how much better his real physical presence would be. The poem ends with the cry of that unfulfilled longing, for which Goethe, the genius, reserves the two exclamation marks in the poem (in contrast to Matthisson's scattergun). All the imaginative modes of perception we have gone through up to this point are unsatisfactory when compared with the reality of a physical presence. This final section is the poetic equivalent of Dr Johnson's famous refutation of the Idealism of Bishop Berkeley by kicking a stone with his foot: 'I refute it thus'. In the contradiction between the two parts of the last verse Goethe brings us to the crux of the philosphical thought of the time. René Descartes (1596-1650) had started the theme of the primacy of the mind with his famous statement cogito ergo sum, effectively saying that existence depends on the subject's thought. Developing this idea, Bishop George Berkeley (1685-1753) posited the 'outer' world to be just a phantasm of the individual's own mind. 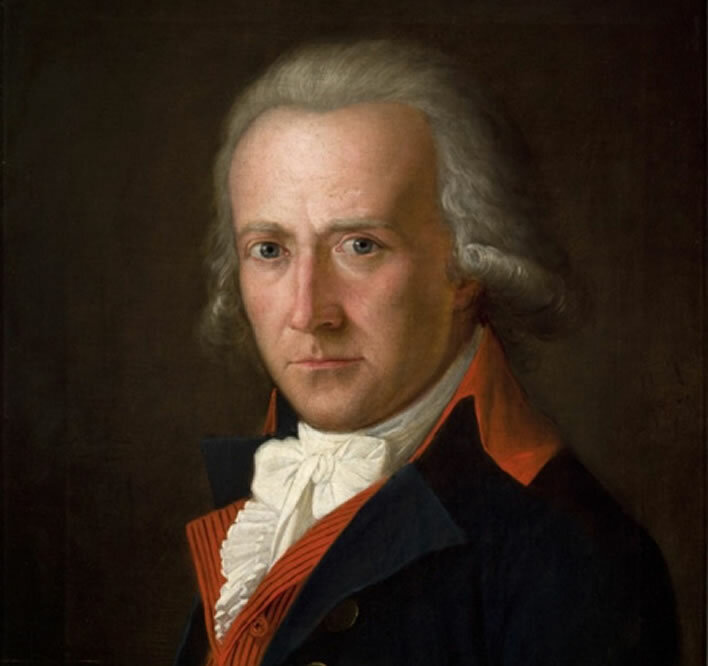 Immanuel Kant (1724-1804), Johann Gottlieb Fichte (1762-1814), Friedrich Wilhelm Schelling (1775-1854) and Georg Wilhelm Friedrich Hegel (1770-1831) developed these ideas to produce the 'Idealism' that dominated German philosophy at the time. Are you a genius like Goethe? Here's a test. Write a poem with powerful imagery that describes separation and longing within a beautiful structure, using the music of an existing melody. In doing so you need to allude to one of the great philosophical issues of the time. Oh, and by the way, do it in eight lines. Goethe's poem is a true work of genius. It has strong imagery, a meaningful structure and great philosphical depths. When the young musical genius Schubert, just turned eighteen, got Goethe's Nähe des Geliebten in his hands wonderful things happened. I dislike talking about music. Just listen to what Franz did on that Monday 27 February 1815 when two geniuses met, if only on paper. You think I am over-egging the custard with all this boring philosophical speculation? Schubert understood. Just listen to the emphasis on denke-sehe-höre-bin-wärst in his musical setting. He knew precisely what Goethe was writing about. At last he had a text before him that was worthy of his genius too! 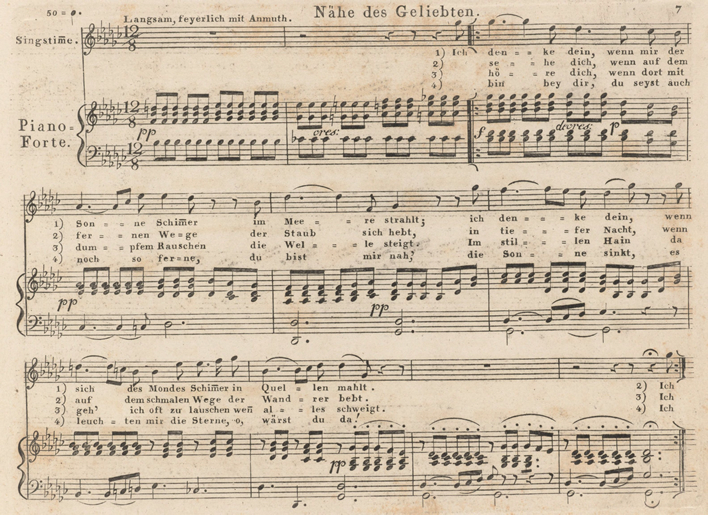 The first published score of Nähe des Geliebten, 1821. Notice Schubert's characteristically precise tempo and marking, particularly the crescendo leading to the forte on the key word of each verse, denke, sehe, höre, bin. The forte that falls on the modality of perception is particularly compelling, since the rest of the song is pianissimo/piano. This is Zelter's score for Brun's Ich denke dein, 1810. In contrast to Schubert's precise marking, Zelter's score is quite flat, leaving it entirely up to the performers to make something out of it. By the way, since we are dealing with Franz Schubert, our workaholic genius, please note that what you are listening to today is his second version (D. 162): on that magical day alone he wrote two versions of this piece. He managed to get the second version published six years later in 1821 with a collection of other Lieder that brought him in a pittance. I have found no publicly available performances of Zelter and Brun's Ich denke dein, which may probably be just incompetence on my part. I have also searched in vain for good performances of Nähe des Geliebten by female singers. A poor bunch on the whole: many of them (such as Elisabeth Schumann of all people) even skip the third verse 'Ich höre dich', thus sabotaging the entire structure of the song and proving that they do not understand what they are singing. Singing is, after all, not just making a nice noise for three minutes whilst wearing a charming frock. The best of the female bunch for me is a creaky recording of Elisabeth Schwarzkopf (soprano) and Edwin Fischer (piano) from October 1952. The reference for how it should be sung is – what else can we expect? – Dietrich Fischer-Dieskau (baritone) and Gerald Moore (piano) from May 1958. Once more Fischer-Dieskau demonstrates his intellectual grasp of his material and his superb control of volume and tempo. ^ Die Achtung, die Matthisson in seiner Zeit genoß, hindert uns nicht, ihn für einen schwachen Poeten zu halten, und so sind auch alle Matthissonlieder Schuberts aus den Jahren 1813-16 nicht von allererster Qualität. Dietrich Fischer-Dieskau, Auf den Spuren der Schubert-Lieder, Werden-Wesen-Wirkung, R A. Brockhaus, Wiesbaden 1971, p. 43. Letter to Friederike Helene Unger, June 13, 1796 in Johann Wolfgang Goethe,Sämtliche Werke nach Epochen seines Schaffens, Münchner Ausgabe, ed. Karl Richter et al., Munich, 1985-99, sectiion 4.1:1121. ^ In respect of Schubert, the 'genius model' still blights scholarship to this day: Vogl's absurd assertion the Schubert composed 'in a trance' distracted early critics from a proper assessment of Schubert's compositional technique. 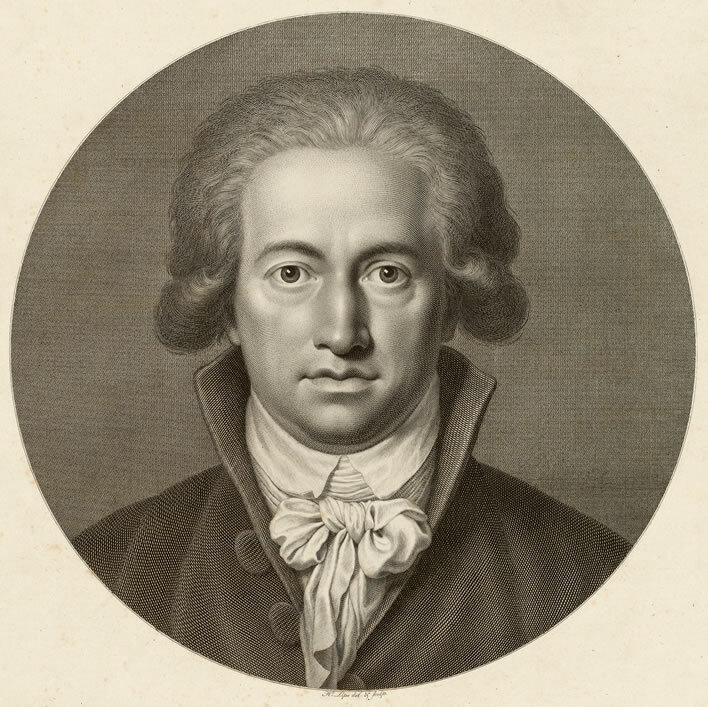 ^ The intricacies of the early publication of Goethe's poem are detailed in a recent paper: David Hill, 'Claudine von Villa Bella and the Publication of "Nähe des Geliebten"' in the Goethe Yearbook, Vol. 22, 2015 pp. 189-202 | 10.1353/gyr.2015.0010. Paywalled article. ^ It has even been suggested that Goethe is writing about a supposed homosexual longing for Friedrich Schiller. The suggestion is absurd and arises from the modern longing on the part of some literary critics to find homosexuality, however repressed, in every writer. Schubert scholarship, too, had a phase of homosexual revisionist criticism. For the record: in the earliest appearance of Nähe des Geliebten the poem was spoken by an actress [v. David Hill, op. cit.]. Although there is nothing in either Matthisson's or Brun's efforts that implies anything as specific or concrete as a gender assignment, it seems fair to assume that Goethe took the voice of the female poet Brun as being the female voice of his reworking. ^ If you have time on your hands, no friends and your television in broken then please follow up this line of thought for yourself. The starting point is Kant's Kritik der reinen Vernunft, 1781 (about 1,000 pages). Good luck. ^ Goethe's poem has been set to music by many composers, among them Loewe, Beethoven and Schumann. We haven't space to consider these here.